Southampton, PA. –CW Industries, a long recognized manufacturer of switches, connectors and custom components for the OEM, has created a separate business unit to focus and market its In-House Plating capabilities to end users in a variety of industries. CW has unique capabilities and incorporates the latest technologies in delivering both selective Reel-To-Reel and Barrel plated products to our customers. Our precise control of the plating process ensures high quality and the lowest possible cost. 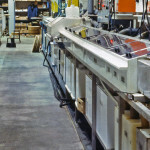 CW plating lines can accommodate a wide variety of shapes and sizes of ferrous and non-ferrous metals. Our plating processes include: Zinc, Nickel, Tin, Solder, Silver, Gold and Palladium. We are environmentally responsible and meet all the necessary EPA and regulatory approvals. Many of CW’s plated connector products are used in sophisticated military electronics and missile systems where reliability and performance are critical in the successful transmission of field data. To ensure the highest levels of quality and compliance, CW uses an X-Ray Fluorescence Spectrometer for measurement and certification. Our barrel plating meets most ASTM, SAE, and AMS standards as well as MIL-G-45204, MIL-P-81728, MIL-T-10727, QQ-S-365, QQ-Z-325 and QQ-N-290 standards. Serving customers since 1904, CW Industries supplies leading military and defense manufacturers with complex electromechanical switches; insulation displacement and Mil Spec connectors; custom switches and connectors and build-to-print contract manufactured products that require a high level of precision, performance and reliability. Our in-house capabilities include molding, plating, stamping, tooling, CNC machining, soldering, assembly, metal finishing and key program and vendor management. Environmental and chamber testing such as thermal shock, salt spray and humidity is performed in our DOD certified test labs. CW Industries is ITAR Registered, IS0 9001 Certified and our in house test facility is qualified to UL, CSA and DOD standards. This entry was posted in CW Industries News. Bookmark the permalink.